Posted on November 24, 2014 by Patricia Tilton •	This entry was posted in Children's Book Review, Japanese American Relocations, Kirby Larson and tagged Animals, Concentration Camps, Japanese Americans, Persecution, Relocation, War. Bookmark the permalink. What a lovely book! Animals are such a comfort during hard times. It’s incredible that it’s based on the author’s real life experiences. Great review, Pat! Thank you Robin. This is such an important book for middle graders to learn the history of Japanese-Americans internment and relocations in 1942. America reacted out of fear. But, the author tells the story with so much heart, with the bond between Mitsi and her dog. What a great way to present a painful experience! Poor Mitsi and poor Dash. I’ll have to check this one out for sure! Thanks Ms Tilton! 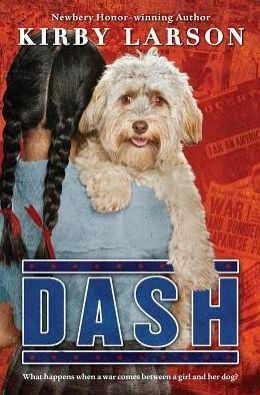 I knew that Rhythm would respond to this story about Mitsi being separated from her best friend, Dash. Great storytelling with so much heart. Great find, Pat! That dog looks like our Sandy. Thanks Catherine. Kirkus just selected DASH as one of the top 110 children’s books for 2014. Like Joy Kogawa´s Naomi´s Road, this is a great book to bring awareness to young people of what happened to the Japanese American´s at that time. These stories also bring awareness to any kind of discrimination and the devastating effects on children in particular. Thanks for reviewing this book. I’m glad you feel the same way as I do. It is so important to make our children aware of discrimination and how it effects children. It’s listed as one of the top 110 children’s books of 2014 by Kirkus! I agree. Thanks for the tweet! Thanks for sharing my review. This sounds like wonderful historical fiction with a moving and meaningful plot. A great one to add to the diversity shelves. You would enjoy Kirby Lawson’s writing style. The plot is meaningful. But, it is a book that tugs at your heart. I remember HATTIE BIG SKY from this author and this one sounds equally good. Perfect choice for this week of Thanksgiving. Thank you for visiting. Such an important story for teens to know about this dark period in our history. Larson is a masterful storyteller. I want to read HATTIE BIG SKY. My book club was just talking about how we need more books about the ‘dark times’ in our country’s history. And here is one! So glad. Yes, this one fits the bill. You will like the author’s style. There’s another MG I reviewed a while back on a similar topic, “Sylvia and Aki,” based on a true story. This sounds amazing. I really enjoy historical fiction. World War II is one of my favorite subjects to study/read about. I will have to check it out! You would love this book, Erik. Very well written. Tough subject, but handled with heart. And, the dog is the heart hook.